“Ghost With the Most” Print Release! This might be what the kids call a “blind drop,” I suppose. 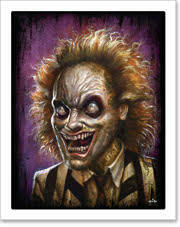 Just in time for Halloween, I’m releasing a limited edition print run of my “Ghost With the Most” Beetlejuice-inspired painting from last year. Limited to only 30 prints, each hand signed and numbered, available today in the webstore. Prints and other available artwork available here. We’ve come for your daughter, Chuck. “MondoCon is a celebration of everything we love, including movies, art, comics, music, toys and food. It’s a weekend curated with our fans in mind, featuring incredible Artists & Creators from around the world, Panels, Screenings, Food Trucks & Interactive Events. This is the second annual MondoCon, and we can’t wait for you guys to see what we have planned. The roster of talent for this event is downright absurd. I’m super looking forward to meeting and hanging out with these legends. I will be there the whole weekend, talking, answering questions, drawing and selling my art. I have several exclusive goodies lined up including small originals, exclusive prints, enamel pins, and fresh original sketchcards done right there on the spot. I’ll be at booth #B18 in Arsenio Hall, at the Marchesa Hall & Theatre in Austin, TX. Doors open at 10AM. Yes, they’ve named their halls after pop culture characters. The Mondo sense of humour is intertwined throughout the whole event. At SDCC, I made up some hand weathered papers that I drew on, available for purchase. For MondoCon, I’ve upped the ante and created one-color screenprints on Stonehenge printmaking paper that have the event info printed on an ornate border treatment. So for $20, I will draw something custom (relatively simple, will have to see how long the lines are!) and you can take home a one-of-a-kind original AND limited edition screenprint AND MondoCon souvenir all in one! For those who want a little something extra, I’ll have some already done in full color and hand stained with my weathered inked look. These babies will be more limited, available for $50 each. I’ve had a total of only 200 of these made, with about 150 available at MondoCon. (The others were a little TOO experimented on, and may see the light of day another time…) This is all an experiment for my first MondoCon, we’ll see if this was a terrible idea or not, as many have expressed that I may have bitten off more than I can chew for such a great deal. We’ll see! Each print will be drawn on by hand at the convention, with some done in advance. Regular black/white simple pen/ink sketch cards $20 each. Elaborate color/embellished sketch cards $50 each. $50 each for full color options, ready to go! In what has become a bit of a calling card for my conventions, I’ll be lugging along a big stack of small original drawings and paintings. I sell these at crazy affordable prices, both as a thank you to convention goers for coming out and coming to my booth, and also because then I don’t have to ship them out. I’ll have about 30 or so small originals from about $75 each up to about $150. If you were ever considering buying an original piece of my art, this would be the perfect time, as my prices are only this low at conventions! Have I mentioned that I hate shipping? So many originals, probably more made by the time I arrive. In addition to my screenprinted sketchcards, I’ll also have a limited edition screenprint. “Herald of Antiquity” will be available as a 12″ x 16″ one color screenprint on Stonehenge printmaking paper. Similarly to the sketchcards, I’ve hand embellished the first twenty prints in one-of-a-kind colorways. More than just a simple added brushstroke or two, these hand embellished prints almost become new originals in their own right with all the painted elements I’ve added. Regular screenprints will be available for $40, with the hand embellished prints available for $75 each. Each print is hand signed and numbered. Print size: 12″ x 18″ Limited edition of 100, one color on Stonehenge printmaking paper. First twenty in the edition hand embellished with inks and acrylic, $75 each. Original on the left, $40 each. Hand embellished on the right, $75 each. Every one of the hand embellished prints is unique- no two alike! I’ll also be selling a select set of enamel pins, designed and created by the good people at Yesterdays, Inc. These awesome pins will be available in limited quantities, exclusively at my booth during MondoCon. $10 each, or get all six for $50, that’s getting one pin free for the mathematically not-so-inclined! There has been extreme interest in these, and they’re expected to go fast so get there early! $10 each or all six for $50- you need these. And last but definitely not least, the excellent crew at Static Medium will be releasing a MondoCon exclusive four print set of some of my works from my recent “Reconfigured” show. “Lifespace,” “Originator,” “Solidarity” and “Pensive” will all be available in a set, with each print size at 7″ x 7″ and individually hand signed and numbered. The prints are limited to a set of only 40 each, and can only be purchased as a set, available for $75. It’s a fantastic deal, four of the highest quality giclée prints, at under $20 a print. They’ll be just around the corner, at booth B17, definitely swing by to talk with these great people and see what else they’ve got in their fantastic print arsenal. Contains four individual 7″ x 7″ prints, in a Limited edition set of only 40 total sets. Archival giclée prints on 100% cotton, each print is hand signed & numbered. Available as a set only, $75 each at the Static Medium booth at MondoCon. I’m super excited for this weekend. There’s more than a good chance I may need a complete week off following all the madness that is to come, but, bring it on. I’m excited to be included in this venue, with the caliber of talent on the roster, and with a targeted show that aims my work directly to an interested audience. Rather than trying to shoehorn my work in and around other conventions where it might not be the best fit, MondoCon is all about art, all about art buyers, pop culture, great food and beer, and an amazing time. I will see you all there!